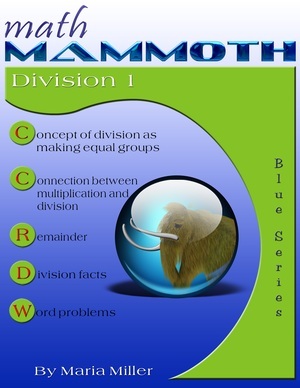 Math Mammoth Blue Series - worktexts by topics: addition, subtraction, clock, multiplication, division, geometry, money, fractions, decimals, measuring, percent. Math Mammoth Blue Series books are worktexts or units on specific math topics. A worktext means that each book includes both the explanations of the concepts and lots of varied problems. Thus, these books combine the textbook and workbook into one. Each book in the series concentrates on a few topics only, such as addition & subtraction, place value, clock, measuring, money, multiplication, division, geometry, fractions, decimals, ratios, percent, integers, and so on. As a review material on specific topics. 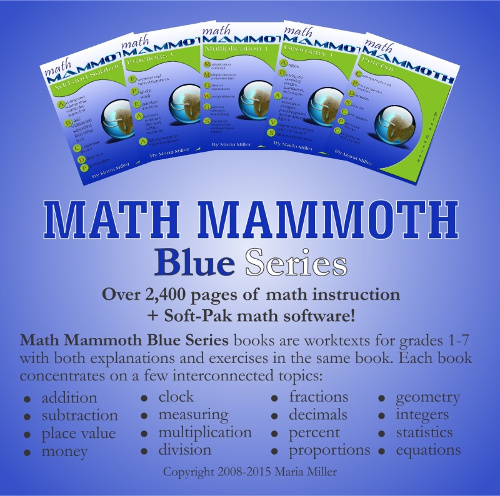 It is even possible to use the Blue Series books as a complete math curriculum; however, in that case, I recommend you to check out Math Mammoth Light Blue series, since it is designed to be exactly that. Get ALL 47 books of the Blue Series at 38% off! You will be purchasing the items from my authorized reseller Comecero, LLC. On the web page of each book on this site, you will find links to purchase the download at Currclick, and a link to purchase the printed copy at Lulu. The books in the Blue Series currently cover all necessary topics for grades 1-7. Please click here for a suggested order of study and grade-level matching for the Blue Series books. The downloadable versions (PDFs) are enabled for annotating. This means that the student can complete the PDF file on the computer, using the typewriter and drawing tools available in Acrobat Reader version 9 or higher, or on a tablet device such as an iPad, using a PDF app that has annotating tools. These books are also available as Spanish versions, which is very useful for English language learners (ESL, EEL, ESOL students). 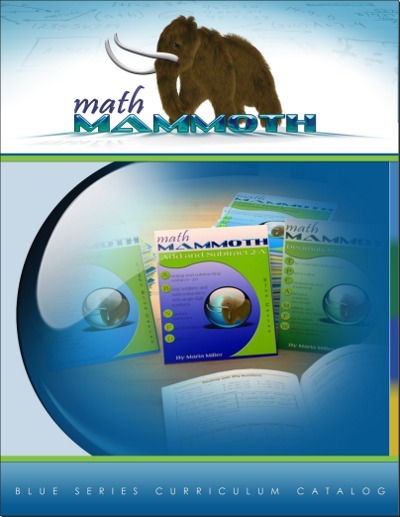 The students can use both the English and Spanish books (Math Mammoth and Mamut Matemáticas) as their math curriculum. If they cannot understand the English version, they can check the corresponding book in Spanish and understand the math from there — and also learn English at the same time. The grade-levels mentioned are recommendations only. The books themselves do not mention any grade levels and are usually usable across several grade levels. Addition 1 - grade 1. Addition within 0-10, missing addend, word problems. $3.95. Subtraction 1 - grade 1. Addition and subtraction facts within 0-10, difference, "more than", word problems. $5.10. Or, you can get the Blue Series books for grades 1-3 only (21 books) for $45 (download). Learn more! Or, you can get the Blue Series books for grades 4-7 only (24 books) for $75 (download). Learn more! Read the complete FAQ here. It is complete in its coverage of topics for grades 1-7, and covers some topics for grade 8. Please keep in mind that several of the books in the Blue Series cover material for several grade levels in one book. It is NOT organized exactly by grade levels. 2. Do all the workbooks come with answer keys? Yes. All of the Blue Series books have answers appended in the worktext. 3. Can I buy the books as hardcopies (print versions)? Yes. The Blue series books are available as printed hardcopies through Lulu.com. 4. In which order should I study the Blue Series books? Please click here to read the answer. 5. Which book is right for my child? You can usually find that directly from considering the math topic that your child finds difficult. Check the table of contents of the various books on that topic to find the best match. Or, check this table that lists the approximate study order and grade levels for the Blue Series books. You can also have your child take a placement test for the Light Blue, email me the results, and I can guide you as to which Blue Series books would be best for your child. Math Mammoth Review — by Sabrina at KidsCrunchAndChrist blog. Math Mammoth Blue Series Review — focusing on Data & Graphs, Statistics and Probability, and Expressions & Equations books. We are a new homeschooling family and I wasn't sure what type of math program to use with my fourth grader. I'm not a math scholar and was nervous about purchasing a curriculum that would leave me just as confused. So far, my son enjoys it, I can understand it to explain it according to current standards, and the convenience of reaching out to the author is helpful. We will continue to use Math Mammoth (Blue, download) in the future. I am utterly thrilled with your resources. They are exactly what I need for my middle school students who have greatly lagging skills. The resources are systematically organized into specific skills to facilitate individualizing student programs, and the lessons are very clearly explained. You focus on what is truly important in a straightforward manner that is readily understandable by students. As well, the resources are not presented in a juvenile manner and are thus usable and approachable to students whose skills are well below grade level. Your resources are the first I have seen to meet all these criteria! I will be using this resource daily going forth from now. And to have Canadian content is a marvelous bonus! I am so glad I found Math Mammoth. I chose the Blue Series, which is organized by concept instead of grade level. Being able to easily find and focus in on specific concepts when my children are ready for them, without feeling constrained by grade level, is important to me. Math Mammoth Blue Series provides this flexibility. I find the way Math Mammoth teaches each concept to be easily accessible. There is enough visual support for my visual learner without the use of wild or distracting graphics such as I've seen in some other programs. The balance of new teaching and review practice seems right on. Math Mammoth Blue Series has made me better able to successfully teach math to my children, and in the process improves my own mathematical thinking. I'm simply thrilled with this program. Thank you so very much for your program. My almost 12-year-old daughter was not happy with math and although she is a whiz at memorizing facts, formulas, and algorithms, she had very little understanding of anything from basic place value to when-to-use-what-operation. I tried several different curriculums and none worked until we found Math Mammoth. I started her on the topic books versus grade level so she wouldn't feel badly doing "4th grade work", but after 6 months, she is happily and accurately speeding through the percents, Fractions/Decimals 3, and Ratios and Proportions books. I love that she now understands math, and what's more, that she loves it! Thank you for these excellent resources. I've just come to buy more. The grade 3 review book has allowed to identify gaps I can fill in with the Blue books. My son and I have been struggling to find anything appropriate, affordable and cumulative, so I am very pleased to find these, with British money too! I purchased the Blue series and could not be more pleased. I am able to fill in gaps or re-enforce concepts where my kids struggle. I highly recommend this product. My daughter is just getting to the point in her math where she can use the resources of yours that we own. We use MUS but we like MM (Blue) for supplementation in areas she needs more work on. I love that the pages are reproducible! I also like that we can "zoom" in on certain areas like your Clock book (I need to get busy with that one!) She has "learned" how to tell time a few times but keeps forgetting because she isn't getting enough regular review :). "...books are very easy to understand. Explanations very clear!" "I LOVE YOUR PRODUCTS! Your approach to math is thorough and explicit -- simply great." "...well set out, logical and easy to use..."
"It's working very well! ... We wanted something that worked according to the principle of mastery, which explained/demonstrated what was expected of the pupil, and assisted the parent in teaching. ... I love the way the pages are laid out - clear, attractive, appropriately colourful yet not cluttered and filled with distracting cartoon characters. It's great value for money, and I love the ebook concept allowing us to print out the sheets we want, or the whole book according to what we need." "I like their simplicity. They are cost effective and seem to have enough drill and practice." "...they did all the teaching for me..."
"These books have allowed me to have more time with my family outside of work hours. The preparation of worksheets as you are aware are very time consuming and I have never found any books that have as much detail in explaning concepts and providing practice questions as your books do." "...Very easy to follow, nice examples, nice mix of problems. Good flow for my kids' pace..."
"...I really like how easy these books make it to teach the kids their math. I also like that I have the ability to jump from grade to grade depending on where the kids need practice." "...The format and content is very logical and clearly presented." "These books have allowed for a lot of flexibility, yet they are well structured so you know they are learning and can track and grade their progress easily. Math isn't complicated, and I appreciate finding a resource that reinforces that concept to my children... and at a fantastic price too!" "I also like the freedom it gives me to move around in the series if the student misses a vital step, going back to fill in what should have been learned but was missed - and doing that without the child feeling threatened with the shame of lower grade work since it is just the next page to him." "I love the way a new concept is introduced and then practiced, practiced, practiced! My kids hated Saxon, because it would introduce a new concept, then only give them 5 problems to do to go with the new concept then the rest of the lesson was a review from previous lessons. By the next day, they forgot the concept that they had learned the day before and were really lost after having to learn a new concept that day." I have used Math Mammoth with my daughter since shortly after she turned five years old. I began by using the sample pages with my daughter to see if the style peaked her interest. She quickly finished the sample pages so I purchased the blue series. We've worked through Addition, Clock, Money, Place Value, Subtraction 1, Multiplication 1 and various areas of Measurement. The learning style is sequential and allows for various methods of finding the answer to the problem. The word problems require the child to use critical thinking and math. I enjoy the internet links provided at the beginning of new chapters. I also am very appreciative of the worksheet generator Math Mammoth provides. My daughter is far ahead of her peers in mathematics. She is now six and instead of just being able to give math facts, she actually understands how and why the facts are as they are, math is not just random numbers to her. 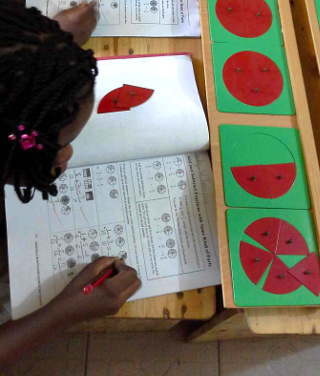 She enjoys math and, when asked, says it is the subject she is best at. My son is now using the Addition 1 worksheets. He's newly four years old but the methods used by Math Mammoth allow him to understand how to manipulate objects and their corresponding numbers into equations that make sense. I can already tell I will have another math lover on my hands!